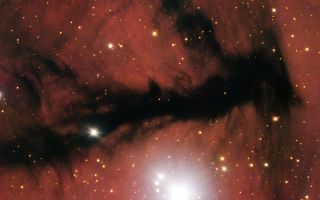 The smoky black silhouette in this gorgeous space wallpaper is part of a large, sparse cloud of partially ionized hydrogen — an HII region — known as Gum 15. The smoky black silhouette in this gorgeous space wallpaper is part of a large, sparse cloud of partially ionized hydrogen — an HII region — known as Gum 15. In wide-field images this nebula appears as a striking reddish purple clump dotted with stars and slashed by opaque, weaving dust lanes. This image homes in on one of these dust lanes, showing the central region of the nebula.